Hilaire with Watson as they appear in a local newspaper in the 1990s. KUCHING: Well known Canadian coach Daniel St Hilaire will be in Sarawak to conduct a coaching clinic from Nov 22-26. The trip here, sponsored by the Sarawak Sports Corporation (SSC), is his second to Malaysia for the former national sprint coach in the 1990s. While here, Hilaire will analyse the specific needs and set up a development plan from the grass-roots to the international level. “Malaysia has the reputation of developing athletes who shine at the South-east Asian Games. “Only a few managed to produce winning feat at the Asian Games. “Any successful system has to start at the beginning with a gifted athlete and have to recruit the best talent identification programme,” said Hilaire. Hilaire, who specialises in the sprints, hurdles and jumps has several world class athletes under his wing. His stable of world class athletes included former Canadian high jump champion Alain Metellus (2.28m), long jumper Edwin Floreal (8.20m), triple jumper Edrick Florial (17.29m) and Bruny Surin who clocked 9.89secs in the 100m at the Olympics. His son, Phillipe now 23, who was born in Kajang, Malaysia is a junior Canadian and US champion in the high jump with a personal best of 2.13m. 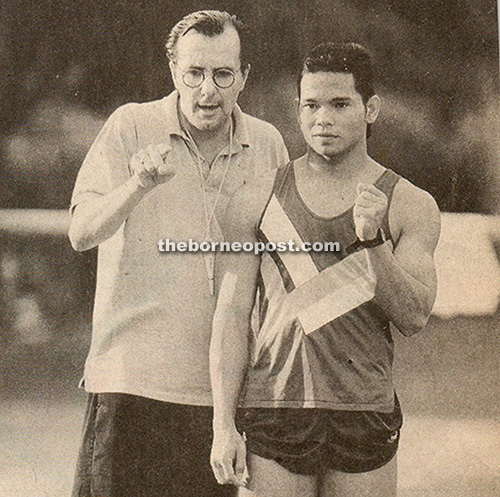 Hiliare was also coach to Sarawak’s “Flying Dayak” Watson Nyambek who under his guidance won the famous “duel of the century” with Azmi Ibrahim in the Pahang Sukma where he set up a new national record of 10.38s. The Miri-born Watson later improved the national record to 10.30s which stood until the 2016 Sukma. Now attached to the club in Toronto in Canada, Hilaire was also the chief advisor to the Hollywood movie “the Race” which featured US hero Jesse Owen in the 1936 Olympic Games. In Sarawak, Hilaire will anaylse, write a report as well as start a programme to raise the profile of athletics in the Sarawak as the State aspires to produce world class athletes. It will be fitting for Sarawak who has recently enjoyed a revival in athletics in the SEA Games with hammer throwers Grace Wong Xiu Mei and Jackie Wong Siew Cheer winning gold medals in Kuala Lumpur in August. The accomplished Canadian coach will also provide assistance to help raise the performance of Sarawak’s national sprinters like Jonathan Nyepa, Nixson Kennedy and Norris Foo, as well as a group of young aspiring sprinters involved in the State Sprint project.